Laying model railroad track is perhaps the most fun part of the hobby for me – right next to building scenery and running trains. Once you start laying track, you begin to see your layout beginning to develop – your dream coming to fruition so to speak. A question that always comes up first is - What type of model train track should I use? There are several different brands and sizes available. Mostly what you use is personal preference. One thing to remember is that the size of the rails is reported as the code. For example code 83 model railroad track has larger rails than code 55 track. 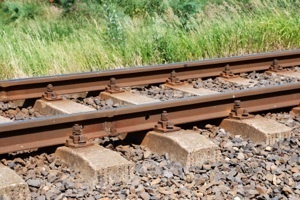 The smaller rails are often used for branch lines and the larger codes are for mainlines. This is often the way they appear in the prototype (real life), so you can simulate that on your layout if you wish. A caveat to this is that you have to make sure that when you make the transition between different codes on the same layout, you have to line up the rails properly so there won’t be any derailments. You may have to use small pieces of wood underneath the railroad ties on the adjoining end of the code 55 track so that the rails of the code 55 track will line up properly with those of the code 83 track. Also, another point to remember is that sometimes branch lines may not have much roadbed, if any, under the track while mainlines almost always do. Model railroad track is sold as sectional track, i.e., small sections of either straight track or curved track that come in 2-3 different standard radii, or as flextrack, a very flexible 3 ft piece of track that can be curved to whatever radius you want. Sectional track, but not flextrack, can also be purchased with roadbed attached. Some model tracks have more realistic appearing railroad ties than others. Many brands have black ties that are far apart. These are probably less realistic than the ones that are brown or gray and are closer together. Of course handlaid track ties are probably the most realistic. Also, the ties can always be painted to look more realistic. Varying the shade of color of the ties is always more realistic than having them all be exactly the same color. This would be tedious and probably not really that noticeable in the smaller scales, but it would make more of a difference in the larger scales. I like to use sectional track for the most part (without the attached roadbed) in places where straight track is required, and when curves with the standard radii are needed. However, flextrack is better if you need curves with nonstandard radii, or if you are making s-shaped curves. 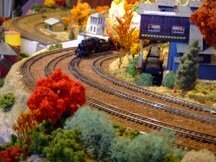 Many model railroaders use flextrak for the whole layout except for the turnouts. One note of caution when making s-shaped curves is that you should always have at least one car-length of straight track between the 2 curves. Otherwise, you will likely have derailments. The first thing to do is have your model railroad track plan in front of you. Remember that your plan is not written in stone. You can change things. As you begin to put down your track and see it in 3D, you might find that it would look better or the trains would flow better if you move things around a bit. Don’t be afraid to experiment. You should take your time with this since you will most likely be living with the results for a while. But again, don’t get so bogged down in it that you don’t keep moving forward. What I like to do at this point is loosely lay out the sectional model railroad tracks on the benchwork as I have designed it on paper – not gluing anything down, and not even necessarily joining any tracks together yet – just putting down pieces of track loosely to see how it will look. You may want to work on one section of the layout at a time if you like, but I prefer to loosely lay out the whole thing as much as possible to really get an idea about how the trains will flow in the space I have available. 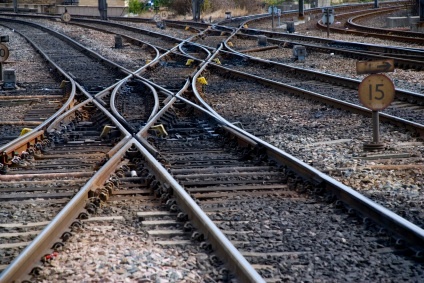 Locate where you will be placing your turnouts on your model railroad track plan. Will you be using remote turnout control or regular manual ground throw switches or both? You will need to be able to reach the manual ground throw switches in order to operate them. What kinds of turnouts will you be using? This is one instance where size matters. The longer turnouts (#6 and above) are more prototypical and smoother in operation with less of a sharp turnoff angle, but require more space. They are better to use if you’re running trains with longer engines and cars, like passenger trains. #4 turnouts on the other hand are shorter, have sharper turnoff angles, but are smaller and easier to install in a smaller space, and won’t look too bad if your engines and cars are shorter. You can now see if your model railroad track planning has been realistic with regard to fitting everything in. It seems that we all have a tendency to cram in as much track as possible in our planning; and then, when we look at it on the layout, it looks like a lot of spaghetti! If you find that you didn’t allow enough room for structures or scenery – a common problem by the way – you can fix it now. Remember that what you do with your model railroad track on one end of the layout may affect the rest of the layout with regard to train flow and purpose. •	Are they able to go where you want them to go? •	Will there be enough clearance on the sides and on top (through tunnels or under bridges) for trains to pass? •	Are your curves too tight? Are they too close together? •	Do you have runaround tracks where you need them to keep locos from being blocked in after the cars have been spotted? •	Are your staging yards, freight yards and branch lines long enough to accommodate the length of trains you wish to run? •	Have you planned for roads, including crossings, underpasses and overpasses? •	Do you have adequate space in your model railroad track plan for industries and scenery? •	How will your trains flow through the terrain or through the towns? •	Where will your mountains, tunnels, rivers, ponds and bridges be located if you haven’t already drawn them on your main trackplan? Is there enough room? •	Do you have a designated mainline? •	If a train needs to stop at a station or industry, can other trains on the mainline get around? •	Will you be using magnetic or electric uncouplers? If so, where should they be installed? •	Will the general purpose or theme of the layout be fulfilled by the model railroad track plan as you have laid it out? •	Have you included operating considerations in your model railroad track planning? Of course, if you are planning a small oval or figure eight type layout, it probably won’t take much time to answer these questions. However, if you are building a large layout with 2 or 3 levels of model railroad tracks servicing 3 or 4 train lines at the same time, you will have to study all of these things carefully. If you are planning 2 or more levels of model railroad track, you will need a way to get your trains from one level to another, unless you want to have 2 separate layouts – one above the other. I think it’s better if the levels are connected somehow – either by a helix (http://www.easyhelix.com) or by creating grades or elevations for your trains to climb. One of the best ways to do this is by using the foam "inclines" made by Woodland Scenics. This takes all the guess work out of it and avoids the need for making complicated calculations. You can buy these inclines in different grades of elevation from 1-4%. You don’t want your grade, or slope, to be any greater than 4% because some locomotives won’t have the power or the traction to carry many cars, if any, much steeper than that. Once your incline has brought you up to the desired height, you can then use "risers" made by the same company to maintain your track at that level or height (usually between 1 to 4 inches above ground) until you're ready for it to go down again to the lower level - at which point you would then use the "incline" in reverse as a downgrade. One nice thing about the foam "inclines" and "risers" is that they are able to be easily curved to whatever radius you desire and can be fastened to the subroadbed with long foam pins until you glue them down later - after you have positioned everything just the way you want it. You can also use the inclines to form a Tehachapi Loop, a prototypical section of track located in California and often emulated by model railroaders as a way of getting the model railroad track to climb from one elevation to another without having to use a steep grade. It is basically a single spiral or loop where the track circles around on a gradually elevating grade to eventually cross over itself at a significantly higher level than where it started, all within a fairly small area of real estate. When arranging curves for your model railroad track, make sure your radius is not too small for the size trains you will be running. I like to use a minimum of 18" radius for my N scale layout. If you are working with HO tracks, you may want to consider a minimum of 22" (rarely, 18" for tight curves). If you have "parallel" curves, make sure they are not too close together so that if you're running trains on both tracks, they are not rubbing against each other on the sides. The easiest way to check this is by taking the longest 2 cars that you will be running on your track, place them on those "parallel" curves and see if there is enough clearance between the two cars. Also, try to include easements on each end of your curves. In other words, your track should go into the curve gradually using a greater radius before you get to the lesser (tighter) radius, then back to the greater radius again, before straightening out. Your trains will run better and look better as they go around curves if you do this. Superelevating the outside rail of your curved model railroad track is advocated by many model railroaders as a way of improving the appearance of your trains as they go around curves, and it looks more prototypical as well, especially when used along with easements. Once you are satisfied with your model railroad track arrangement, you can start gluing down roadbed, working on one section at a time. Roadbed is commercially available as cork or foam and is manufactured in various scales in 36” strips. It can be separated down the middle into 2 long strips. When you are sure of the proper placement of a section of your model railroad track, you can make dots on the subroadbed between the track ties with a felt tipped pen. Then lift the track off the layout, and glue down one of the ½ strips with the inner edge lined up along the dots. (The beveled edge of the strip is the outer edge.) Then glue the other half of the strip lining it up along the inner edge of the first ½ strip. After you’ve glued down 1 or 2 sections of roadbed, you can then set the track back down on top of the roadbed. You can now join the small sections of track together, if you haven’t already done so, with the rail joiners provided with the track when you purchased it. Start at one end of the layout and work on one small area at a time. Once that section of the track has been fastened down, move on to the next adjacent area. Make sure the top edges of the joints are lined up well and that there are no catches as you run your finger over each joint. At this point, I like to solder most of the joints together to assure that the joints stay lined up well. Use a straight edge for straight tracks or use your eyes to look horizontally down the track at eye level to make sure the tracks are lined up properly. You can then glue the track down using a “wet”, diluted ¼ solution of Elmer’s glue (diluted with water and also containing a small amount of rubbing alcohol to make it flow more easily). I like to use a dropper or pipette to drop the diluted glue between the ties and let it spread under the ties. If some of the glue gets on the top surface of the ties, that’s ok. The white glue will become transparent when it dries. Clean off the top of the rails before the glue dries so that you don’t have problems with electrical pickup from the rails later when you try to run trains. Be careful not to get any glue in the points of any of the turnouts. They probably won't work later if you do. I tend to use little or no glue in the area of the turnouts for that reason. As mentioned above, I usually solder most of the rail joints to assure that they will stay lined up properly to prevent derailments and to assure good electrical conductivity throughout the layout. I like using flextrack even better than using the smaller sections of straight track and curved track. It is more versatile. There are fewer joints to worry about. And it’s easier to make the curves fit into the spaces where you need them to fit. One of the most important things to remember about laying flextrack however is that you should try to avoid having a flextrack joint in the middle of a curve because it’s not easy to line up the joints properly and keep them lined up until the glue dries. If it’s unavoidable, then you should solder the joints together while the track is straight before you flex the track and put it on your layout. The soldered joints will then hold the curve well and you won’t be able to tell there’s a joint there unless you look very closely – especially after the ballast has been put down. Also, when using flextrack, you will need to have a good set of railnippers or a metal handsaw for cutting the rails, and wear protective glasses when you cut rails to avoid tiny metal fragments from getting in your eyes. You will have to nip off 1 or 2 of the plastic ties on the bottom of each end of the flextrack so that the railjoiners will fit. I like to save those ties and reinsert them back in place after the track is fastened down, so there are no empty spaces where the ties should be. When you bend a piece of flextrack, you will notice that one rail is stationary respective to the ties and the other rail slips through the little plastic flanges on the ties. When laying the flextrack on a curve, place it so that the stationary rail is on the outside and the slippery rail is on the inside. You won't waste as much track that way. Also, when laying flextrack on a curve, position it so that you have an easement into and out of the curve. In addition, I like to use a small piece of standard sectional curved track, with the minimum radius that I want to use on my layout, as a guide, so that I won't allow myself to make the curves too tight with the flextrack. I know that as long as my flextrack radius is larger than my minimum sectional track radius, I'll be okay. Be careful when you cut the end of the one rail after you've positioned the flextrack on the layout, that it is a nice straight cut and not angled so that there will be a gap in the joint (which you don't want). As you position the flextrack on your layout on top of your roadbed, use long foam pins, or thumb tacks if fastening to wood, that will hold the flextrack in place until you are able to either glue it or nail it down. Make sure the joints are smooth and well-aligned to avoid derailments later. If you’re laying model railroad track and roadbed directly on plywood or homasote, you can buy small nails made for the purpose of nailing your track to the subroadbed. You won’t be able to do this, of course, if you’re using foam for the subroadbed. You’ll have to use glue as described above. Hand laying model railroad track is another option that some experienced model railroaders like to do. This involves using raw materials that you can purchase at a hobby store or online and laying down each railroad tie and each rail of track on the ties making sure that the gauge is correct between the rails along the way. Making turnouts and crossovers this way is somewhat tedious and time consuming, but very rewarding in the end. Many model railroad craftsmen have hand laid track for their entire layouts. I have not done this myself, but I’m sure the feeling of accomplishment and the pride of having a unique scratchbuilt layout unlike any other must be very satisfying. After you have laid your model railroad track, you may wish to paint it to achieve a more realistic appearance. You can use an airbrush for this or a regular brush or a paint-marker sold in hobby stores. I would use brown or gray for the ties and a rust-brown color for the rails. Make sure you wipe off the top of the rails as you go along to keep the paint from drying there. It will be more difficult to clean it off later. If you like airbrushing, now is the time to do it, before you’ve put a lot of scenery around the track. That way, you won’t get a lot of overspray all over your scenery. Finally, you're ready to put down ballast within and around your railroad ties. Be sure to choose the appropriate size ballast for your model railroad track scale and choose the right color for your locale and to complement the colors of the rest of your scenery. Keeping your tracks clean cannot be overemphasized. There are inexpensive products and solutions on the market and in hobby stores that are expressly made for this purpose and should be used often. In fact if your engines don't seem to be getting enough power, if they have jerky movements, or if they stop in the middle of their journey when you don't want them to, the most common cause of these problems is dirty tracks. There are lots of books and articles you can read for reference and to get additional ideas on different types of model railroad track and how best to put it down on your layout. The above description is what has worked well for me. Q - For painting the track and the rails: Just paint the inside/outside of the rail or also the top? A - Just the inside and outside. Not the top. In fact, if you get any paint on the top, you should wipe it off right away to prevent electrical conduction problems when you run your trains. Q - Which kind of paint should I use to not interrupt the current (with the DCC signal) flowing in the rails? A - You can use any kind of paint you wish as long as you don't get any on the top of the rails. I found it was easy recently to use a paint marker that I bought in a hobby store to paint the ties and the rails. You can use an airbrush if you like. You may wish to use brown or gray for the ties and a rust color (Polly Scale Rust) for the sides of the rails. DON'T use shoe polish as some modelers do, because then later, when you put the ballast down using a mixture of water or alcohol and white glue, the shoe polish will run and "bleed" into the ballast, making a mess. From "Model Railroad Track" to "Homepage"